They can make a song fun and enjoyable to sing and they can also help the children learn the words. I sometimes make actions up to help children learn the words. 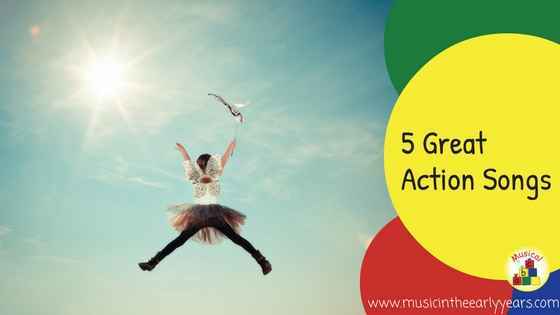 There are many action songs but I have chosen 5 which both the children and I enjoy. 1. Head Shoulders Knees and Toes. When I sing it with the under 5s we sing it at a fairly slow pace until it is well known. I wouldn't attempt the missing the words out with children under 4. When I taught Reception the majority of the children, once the song was well known, enjoyed attempting to miss the words out. Insert other events for additional verses: doors, open and shut; wipers, swish swish; children, up and down…. I usually do this song with a prop; instead of the children pretending to move an oar they hold onto some stretchy fabric and move that as we sing. Into the water we go. SPLASH! Don’t forget to scream ARGHHH! We usually stand up to do this song. The children love wobbling like a jelly and shaking the sweeties. These songs and, the many more are available in my online resources Early Years Music Ideas.